Yeah! It’s Battle Creek time again! 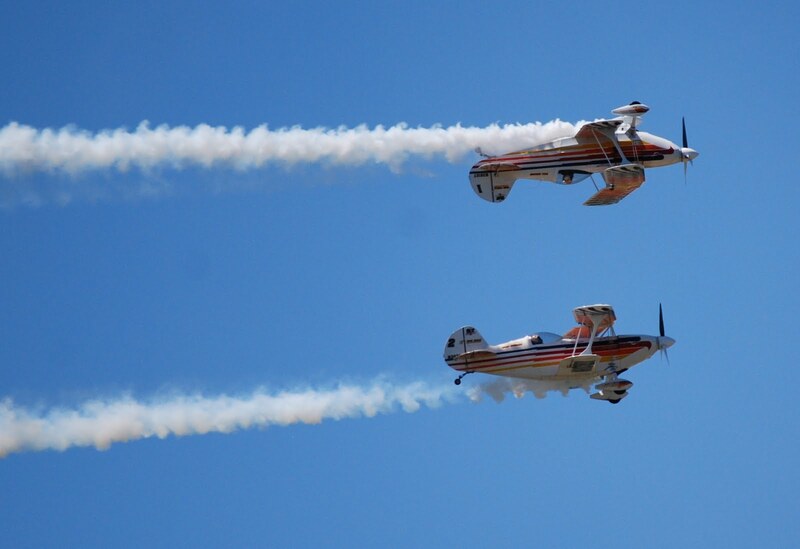 The Battle Creek Field of Flight Airshow and Balloon Festival is going on now through Sunday in Battle Creek, Michigan. I spent the day on the field (when I wasn’t up in a balloon) and shot stills and video and caught up with my friends there. And, naturally, I got a preview of the attractions this year. 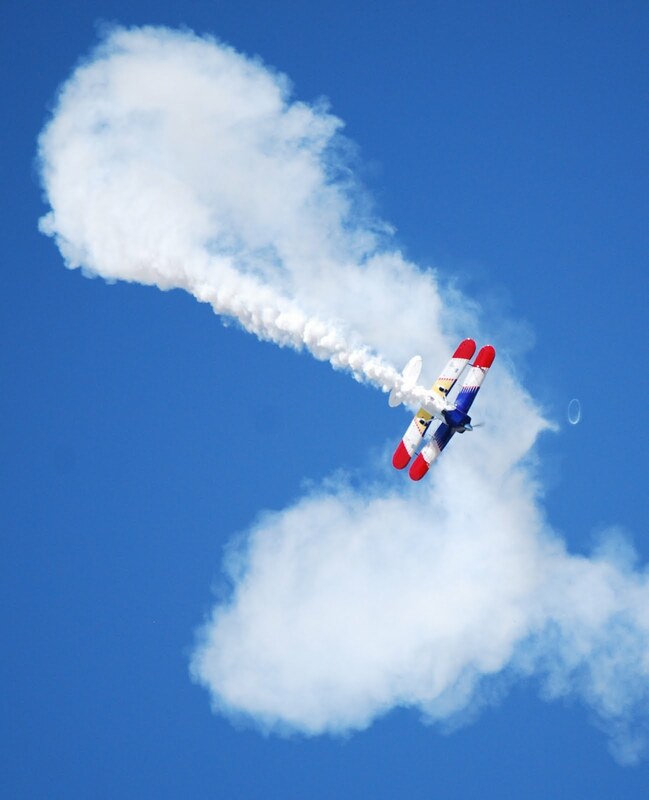 Randy Harris of Bearfoot Aerobatics really flies beautifully. I think his Skybolt 300 is one of the most photogenic airplanes on the field this year. It was really catching the sun today in a way that not a lot of aircraft do (especially when you consider where the sun is when you’re facing north on a crowd line but the acro is flown along Runway 5-23 – You have very narrow angular area where the sun makes it worthwhile to shoot). The airplane puts out a lot of smoke, too, which makes the presentation even more dramatic. The F-22 Raptor is headlining the show this year. It’s no secret that I’m a huge raptor fan and I got up close and personal with both of the specimens that were on the ramp. David “Zeke” Skalicky, Maj, USAF, is flying the Raptor this year and he put her through her paces. I can do some of that stuff in a Citabria, but I have to do it at 60 KIAS and then I have to recover from the ensuing spin. The handling is just too sweet for words. My only complaint is that the aircraft doesn’t come in a two-seat variant. 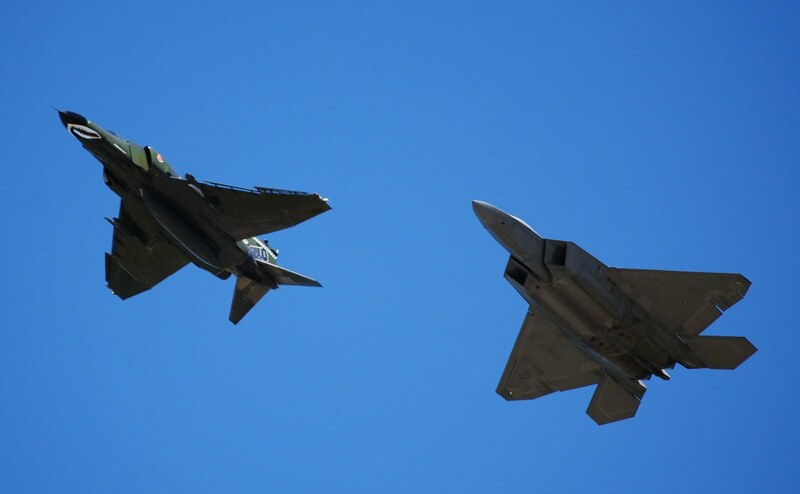 The Raptor is flying with a F-4 Phantom II for the heritage flight. I’ve never been a Phantom fan because I’ve always seen it as a misguided foray away from the core Boydian energy-maneuverability philosophy that makes this kind of flying worthwhile. The Phantom was a missiles-only ship for most of its operational service life. Only later did they add the gun. Maybe the Raptor (which is about as automated an aircraft as we have that still has a seat in it and fights BVR and drops JADAM) ) is the more proper expression of what the Phantom’s designers had in mind. I’m hopelessly romantic about the idea that one ought to crank and bank and engage in combat where the actual maneuvers of the airplane matter. Regardless of whether the Raptor fights BVR, it can move like nothing else out there and perhaps there’s poetry in flying the Phantom in the formation – Maybe the Raptor is the redemption of the Phantom. Or maybe I’m full of crap. Either way, the Raptor is much more fun to watch than the Phantom. Even if the Phantom has two seats. Am I over-thinking this? Come on, Steve, it’s an airshow! Enjoy yourself! Truth is, I really am enjoying myself. The formation flight is beautiful and well-executed and I’m having a great time. I interviewed the safety officer for the demo team in front of the airplane for Airspeed and Acro Camp. It was a good interview and he was enthusiastic about the airframe. I need to get his name from his tag in the video. The team was ready to brief the demo and the captain was very kind to take a few minutes to do the interview at that point in the day. I don’t have the hardware to pull the video off the cards here in Battle Creek, so it’ll have to wait until I get back the Airspeed HQ. Last thing about the Raptor. I know that everyone thinks that a jet team like the Thunderbirds of the Blues is necessary to anchor an airshow. And nobody loves jet teams more than I do. 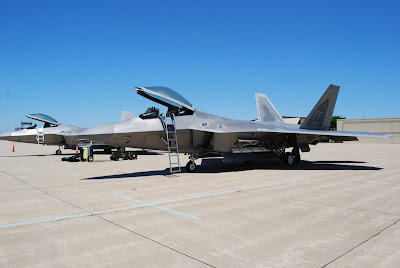 But I think that the F-22 is a wholly satisfying anchor demo for an airshow. For the reasons stated above and because it gives the show an opportunity to really craft the mix of other acts on the schedule. This is a really satisfying airshow with 100LL and JP-8 burners and pyro and other elements. I’m really looking forward to watching this tomorrow with a crowd pressed up against the snow fence. The Iron Eagle Aerobatic Team was also there to play. Formation acro is just such a quantum leap from single-ship acro. And these guys get really close and match each other so nicely. It’s just a joy to watch. Satisfying prop whine, lots of smoke, and dramatic coverage of the show line. What’s not to like? Bob Carlton demonstrated some truly beautiful stuff in his Super Salto. 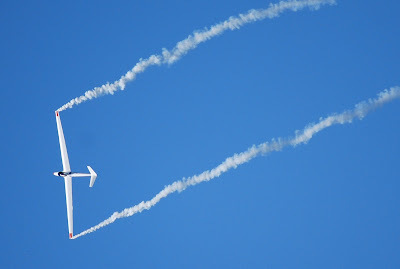 It’s a sailplane powered by the PBS TJ-100 jet engine that puts out 225 pounds of thrust, which is more than enough to aloow the sailplane to self-launch and makes it the only sailplane on the airshow circuit capable of performing a low-level, jet-powered airshow program. I didn’t expect to enjoy Bob’s routine as much as I did. Maybe it’s the same thing I feel when I’m watching John Mohr or Greg Koontz. Although the Super Salto has a jet engine, it’s not that powerful and I’d imagine that it requires some pretty good pilot chops and attention to energy management to make it do the things that Bob makes it do. Get the heck out here and enjoy this show! The weather is supposed to be great, the schedule is well-rounded, and the grounds are ready to go. Adults are only $10 and kids under four feet are free!